“No matter where we think we are on our spiritual path, there is always somewhere, and something, deeper to experience. Our Lady Of The Rose Crown appears when you are about to enter into another level of spiritual experience. This new level will be appropriate and healing for you – taking you naturally along in your spiritual progress. What might be suitable for another is unlikely to be exactly right for you. Our Lady watches over you with all-knowing tenderness and fierce protection. Only what you need, will come to you. You have been preparing for this time, quite possibly without realizing it consciously. It can take years of preparation to be ready for the next level of spiritual awakening. In order to be prepared, we might have to be challenged in a relationship that really stretches or breaks our heart. In that situation we are leaving to love more unconditionally, to either let the relationship go or to stay with it, depending on what is right for us. we might experience weeks, months or even years of not really knowing, with any certainty, if we are on the right path or living the life we are supposed to be living. In that continued crisis, we are learning how to remain present, to remain open and to learn to trust, even in the absence of clarity. Or perhaps everything in our life seems to be upside down; a loved one is struggling, or our own inability to resolve an issue that has troubled us deeply for some time, and is causing us to feel almost unbearable anguish. No matter what the crisis or challenge, the way that we learned to respond and grow through it provided us with the development that we needed to be able to sustain the next level of divine experience. Love is the most powerful force in our universe. It is in everything and reveals itself in unlimited ways. To encounter this love, to be open to it, ready to receive it and be changed, illuminated, irradiated by it, takes tremendous preparation. Spiritual energy, and the presence of the Divine Mother, is very real and extremely powerful. It is, in some ways, like the energy of the sun. It can give life, but equally, it can be destructive if we do not acknowledge and manage the effect of its power upon us, for good or ill. What is loving and uplifting at one phase of our journey will not necessarily be enough to lift us into the next phase of our journey. For this next phase, perhaps we need more challenge, or more loving presence to leave behind what we thought we knew, and how we thought we needed to live, in order to allow more of the Divine to live through us, into the world. 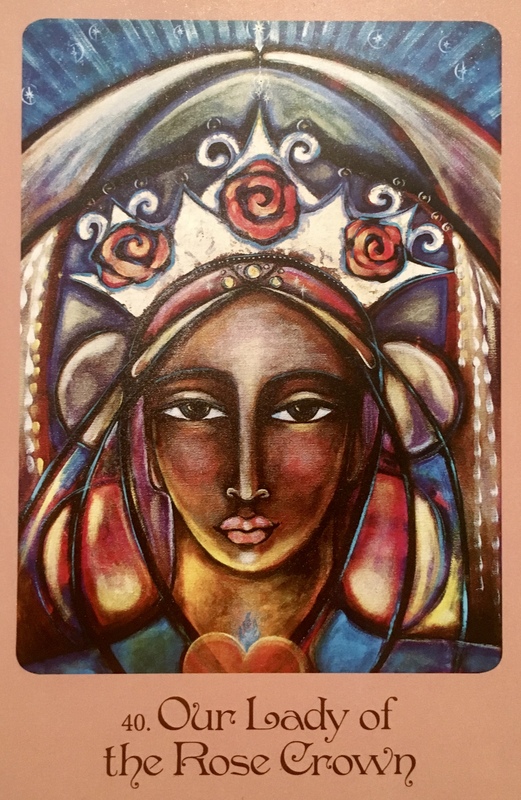 Our Lady Of The Rose Crown comes to tell you that you have been in preparation, and now the time is fast approaching, or is already upon you, where by you are opening to more divine realization. This is a sacred and precious gift, and is happening in perfect accordance with your own spiritual growth. She asks that you drop preconceived expectations of how this will manifest, and simply be present to what is happening within you and your life now. No matter what you may initially think, what you are being shown right now is more of the Divine in its mysterious, creative, funny and unfathomable genius. Whether you can make sense of it or not, your heart and soul will be fed by it, strengthened and empowered to more fully live you divine light and discover who you truly are; a magnificent royal child of the Divine Father and Divine Mother. What doesn’t kill us makes us stronger right? How strong are you feeling right now after everything you have been through? Are you feeling strong, or are you feeling weary. Either way, you are where you need to be on this journey, and things are going to get better as you cross the finish line with this challenge. You have passed with flying colours. Congratulations, the struggle is finally over. Know that the biggest gift you will receive right now is found within you. You hold the key. The biggest gift is your open heart; your shifted perspective. Your understanding of the bigger picture. Your biggest gift is who you are and all you stand for. Your power. Your beauty. Your strength and courage in the face of adversity. Your Love and your pure light. That is the gift. Find the gift and use it to help others. Use it to heal, to grow, to expand and to awaken. Use it for the Highest Good of All. We need it now, more than ever. There is no time to waste. Heal and be healed. Love and be loved. Be the Truth. Be the Way. Be the Light. Yesturday was my birthday and have been dealing the same fearful, draining and hard repetitive pattern for years! I am crying because I went to the A.O. website and the ” small gift” was indeed like a different perception on how to handle these awful people. Another situation came up this week and I cried out again to ask for help, insight, something! After learning weeks before that fear was causing me to lose my personal power for the sake of others happiness and just fear itself too! And after reading the AO blog yesturday I learned not to have knee jerk reactions with those who are up to no good and yet (as i have learned previously ) hold my ground stand up for myself and my needs and not giving away my own personal power by being more compassionate or nice than what needs to be and not saying more than what needs to be said (- boundaries!!! )!